In chatting with a sweet (much younger than I am) mama in church last week – I shared with her this recognizable memory from my days as a young mama. As for me that day, I drove home in my old van, in sweatpants and a sweatshirt (basically the yoga clothes of that day) and I chose to be dissatisfied with my life. I lothed where we lived, disliked our van with its ripped seats and right then, I wanted to wear a pretty raincoat that came with a fulfilling job. I can remember those feelings like it was yesterday. As I share that story now, I can smile, breath deeply and embrace my life then. If I could talk to myself then, I would now tell myself that this was a season of my life. Just one season of many that have come and gone. We would not always live in a double-wide trailer, my preschooler would grow up as would the older girls into capable, strong, lovely women and the old van would get replaced. I would never have a fancy raincoat (that would now probably be in a landfill), but I would have many career opportunities to use my gifts and talents. 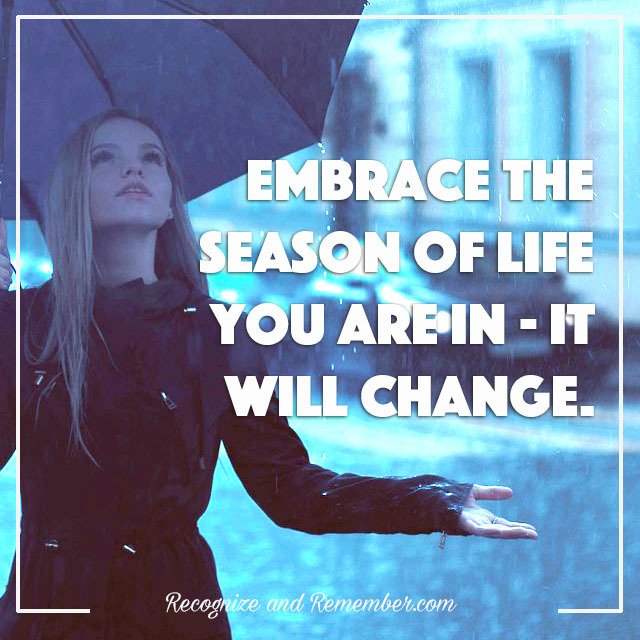 Even now, I continue to learn to embrace the season my life is in now. Although it is not a fancy raincoat that now sways me, it can easily be something such as success in an area I desire or financial security. The writer of Ecclesiastes 3:1 said it best … “There is a time for everything, and a season for every activity under the heavens” (click here to read the rest of this passage). Help me Lord, to embrace the season of life you have me in at this time and to trust only You to fulfill Your purposes for me. Only with You can I embrace my life at this moment and be fulfilled knowing that I am right where You desire me to be.